A gift from Gail Ambrosius creates a distinctive impression. Whether it’s a two-piece box to say “thank you” or an elegant customized truffle collection to impress important clients and valued colleagues, we help you set the right tone. Choose from our logo box or a customized solid-color box. Colors include aubergine, pistachio, mocha, black, silver metallic, frosted, dusty gold, robin’s egg blue, brown, cream, gold metallic, white, pumpkin orange, bright pink and red. We will also be happy to work with you to find boxes that match your corporate colors. Boxes can be decorated with custom labels or ribbons that you provide. In addition, we can include handwritten notes for a special touch. Our two-piece boxes start at $4.25; four-piece at $8; six-piece at $11.75; and 12-piece box at $23. We offer flexible shipping options. We can ship to one or multiple address as well as ship orders to individual clients’ offices and home addresses. 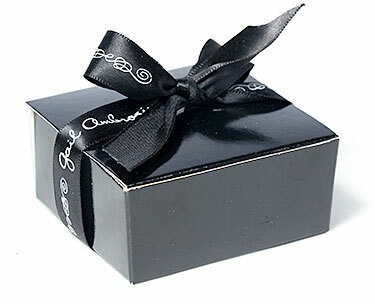 Please give us at least two weeks’ advance notice for corporate gifts to ensure that your packaging arrives. For elaborate or especially large orders (more than 200 boxes), we may require more notice. Volume discounts are available on most orders exceeding 25 “units”. Contact Isaac (isaac@gailambrosius.com) who will guide you through our options and provide a customized quote.